Many times during spoon collecting, we find spoons that have a meaning, but that meaning is not obvious. Sometimes, there are clues such as abbreviations, wording, numbers or pictures. Part of the fun is deciphering the clues. Most likely when the spoon was created, its meaning was obvious to the potential buyers. But after the passage of 100 years and when the spoon is "out of context" the meaning has been lost. Thus I will occasionally be posting spoons in this exhibit which have eluded their meaning to me. I invite you to try to decipher the meaning and send me your analysis. As you can see, the stem is basically a rectangular shape, but it is set at an angle so it appears to be triangular from the top. There is some applied serrated wiring and note that the handle joins the serving end at the front, instead of at the back which is more usual. The pieces are marked in the French style on the front of the serving end and on each side of the stem. The right mark (not shown) clearly says 850. I assume that is the purity mark. None of my references indicated that an 850 mark was used. I suspect that we will know the origin of the spoon when we trace this mark. The left mark which is shown appears to be Arabic script, but I could be wrong. Some Tunisian marks bore a slight similarity, but not enough that I was convinced. The styling of the stem would seem to indicate a very ancient spoon, but the styling of the fork and spoon bowl would lead me to a Victorian age. I am also not sure when the French started to put the marks in the bowl in this manner. This spoon is now identified as coming from Argentina. The wire wrapping with the little balls represents a Bolas which is swung around and then hurled at a running animal. This is probably a modified yerba mate spoon for the traditional herbal tea served in the southern South American area. This demi gold-plated spoon bowl has a bell embossed which is labeled "Hoyt's A Midnight". I thought that it was possibly an advertising spoon but found nothing in my research. It may also have to do with some type of "mission", or it may be related to something else. The back is marked "sterling"
This piece is a real puzzler. First I suspect that it is quite old (probably several hundred years) and it is obviously hand made. Second it is not silver, it is probably some alloy of iron. Third it is probably not for food usage. The top picture shows the unit in the "closed position". As you can see it has a long stem that tapers from flat to round and ends in a round ball finial. In the open position, you can see that there are two round spoon-like parts and in the center is a flat disc. It is very tight when closed but in its current state it could not hold a liquid or powdered material. When new it could have possibly held those types of material. The inside appears to be black and it is possible that it was used to heat something up. It does not have any writing on it, but there is one small area that could have been a punch mark, or it just may be deterioration. It looks to me like it has been cast. I have been told that it was from India, but IMHO that is probably just a guess. 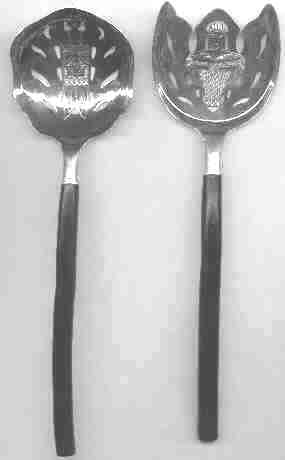 It has been suggested that the "spoon" was used to make lead balls for old musket type guns. The lead would be placed in each half and then heated. The two halves would then be made into one round ball. I guess this is reasonable, but I am not familiar with this process. I suspect that this is a Moslem holy place or something like it. 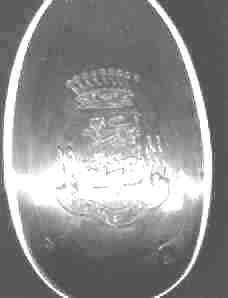 The spoon is marked "sterling silver". It is hand made. There are no other clues. Strange, the way things work out. I was at a flea market and saw a woman wearing a shirt with this symbol on it. I asked her about it and she told me it was a large Moslem temple in Istanbul, Turkey. This very interesting salad set is unmarked, and there are no clues other than the design. The handles are made out of a very hard dark wood (similar to ebony). 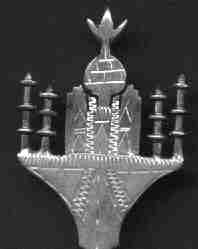 The fork with the maiden holding a basket is probably the clue that will identify this set. The pieces appear to be quality silver and are all hand done and nicely engraved. Based upon styling I would suspect the 1880 - 1900 time period (guess). (Length approx. 9" /230mm). I would guess that they are from the Philippines, but????? I have no idea as to the purpose of this spoon. The total length is about 7.25" (185mm) and it appears to be hand made. 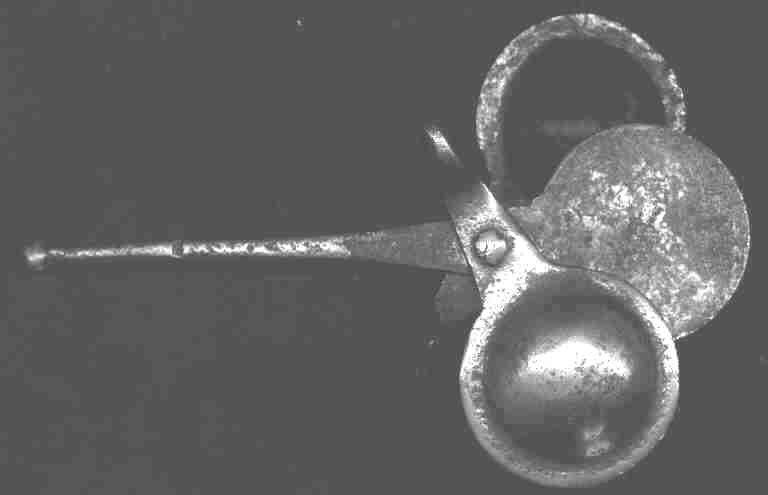 The top of the rectangular shaped handle is cut off like an old "slip end" spoon. I suspect that it might be an "arts and crafts" piece, but I am not sure. I have also been unable to trace the marks. The left mark in a rectangular cartouche says "prima ns" and the right mark says "AxR". Normally an "ns" mark means "nickel silver" but I acid tested this spoon and it appears to be sterling quality. I purchased this ordinary looking spoon with British marks and figured that it would be easy to figure out. 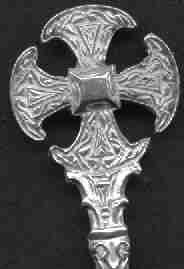 I haven't been able to trace this strange looking cross but suspect that it is a Scottish or Celtic cross. Any suggestions? Then to compound the problem, I decided to take a closer look at what appear to be normal British hallmarks (picture below). The marks appear to indicate that it is from Birmingham and to the sterling standard. But the DATE letter does not conform to the marks in any of my books. This is the first time that I have not been able to trace an ordinary British souvenir spoon. This is not a valuable piece and I wouldn't think that somebody would try to forge hallmarks on it, but I am at a loss to explain why the date mark is invalid. The date appears to be a capital fancy script A in a square cartouche. The style of the "A" does not conform to any of the styles in my book. The square cartouche is consistent with the series starting in 1936 and I would guess that this is a reasonable age for this spoon, but I don't know why the style of lettering doesn't conform. Any ideas? 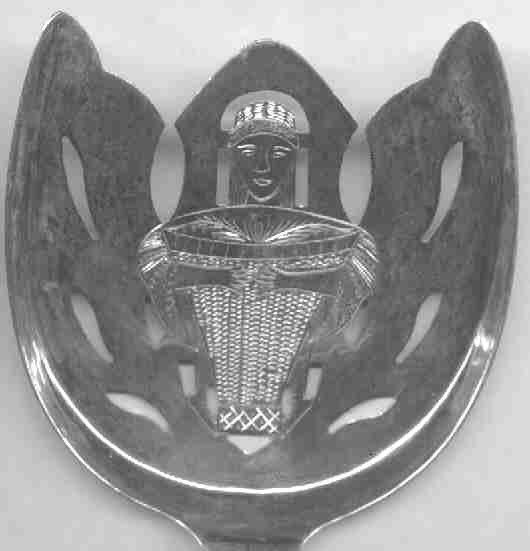 This tea sized silver spoon bears a French Minerva head mark in the bowl and I would guess that it was made from a stamping die. The finial shows a rising (setting?) 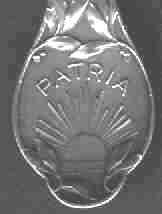 sun and the word "PATRIA", which I surmise means fatherland or something to that effect. 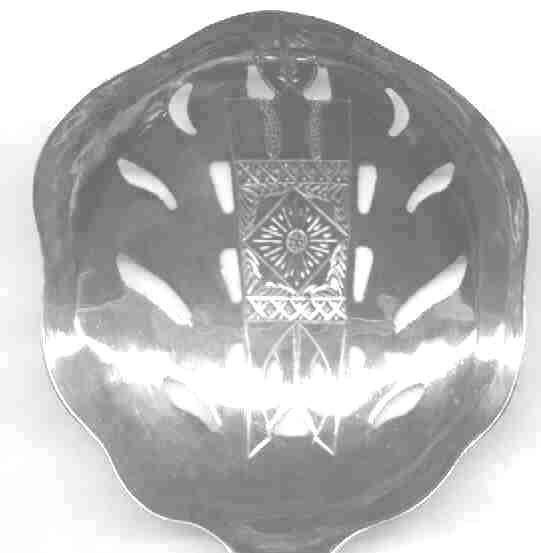 The bowl has a hand engraved coat of arms with two left facing lions topped by a crown. Underneath is the word "ETRETAT"